Nicky Law hopes a full Ibrox against Queen of the South on Tuesday night will belatedly signal the start of Rangers’ revival. A dreadful goalless draw at Cowdenbeath in the Scottish Championship on Saturday dampened some of the enthusiasm which enveloped the Light Blue legions after Dave King’s consortium, including Paul Murray and John Gilligan, wrested control from the old board at an extraordinary general meeting on Friday. The Govan club have won just three games out of nine since Kenny McDowall took over from Ally McCoist in a caretaker capacity in December and sit three points behind second-placed Hibernian having played two games less, with leaders Hearts 20 points clear and steaming away towards the title. Law is looking for a massive crowd to come along against the Doonhamers where Rangers will try to get their promotion prospects back on track. 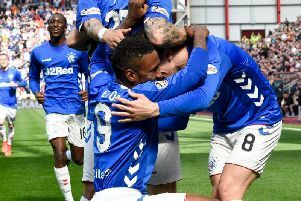 The Gers midfielder said: “I’m delighted for the fans more than anything at the boardroom changes because they’ve been waiting a long time for that and I believe most of them are delighted with the outcome. “I just hope it brings the fans back and they are be back for us on Tuesday and we can push on. “When I first came there were 40,000 every week. They’ve been staying away for whatever reason but it seems like it will be a full house this time. “The change of manager of late has been tough but we hope the positivity coming out of the club on Friday can translate onto the field with a hugely important couple of months. “Our form has been nowhere near good enough since we lost our manager. “We weren’t playing great up until then but were getting the results. “The noises coming out are that there is no rush with the manager situation and as long as you know either way it’s fine. “If Kenny is moving us forward until the end of the season or whenever then that’s good enough for us. The Championship match against the Blue Brazil, who were beaten 10-0 at Hearts last week, was played in atrocious conditions and on a poor pitch where Gers skipper Lee McCulloch came closest to breaking the deadlock on the stroke of half-time with a header that smacked off the bar. The former Motherwell player said: “It was very disappointing but it was never going to be a good game. “You couldn’t play football. It was impossible. The pitch was a swamp and there were gale force winds. “We had the advantage in the first half but couldn’t hit the target with our chances. “We planned to put on a show and get the win with everything that happened on Friday but it just didn’t turn out that way.